We’ve talked before about how mold can negatively affect the physical health of those who live in your home and what the symptoms of biotoxin illness are. But something we haven’t addressed yet is how your home can also show signs that could indicate you have a mold problem. Just like a runny nose could be a sign that you might be coming down with a cold, there are certain signs that can occur within your home that could suggest there is mold growing somewhere inside. In this blog post we’ll take a look at what those signs are and what steps you should take if you discover there is indeed mold in your home. Probably the most common sign that you’d associate with mold is a smell or odor. Often described as musty, aged or earthy – you typically don’t run into a mold problem without some kind of odor being present in the area the mold is growing. It’s important to understand that if you smell something like this, it’s more than likely indicative of a mold problem. Just like you wouldn’t ignore a runny nose or hacking cough, you shouldn’t ignore these types of smells either. Once you think that you are smelling mold, the next step is to look for visual signs of mold. Start in the room or area where the odor is the strongest. Remember, mold needs moisture to grow, so think about where a source of moisture might be coming from in the area you are smelling mold. For example, let’s say you went into your finished basement one day, and you were overcome by a mildewy odor that hadn’t been present just a few days earlier. Where do you think that moisture source could be located? Perhaps there are water pipes running behind the drop ceiling in your basement, and unbeknownst to you a pipe has slowly been leaking water on the ceiling and the porous wooden joists. Maybe there’s a plumbing issue with the bathroom or laundry room and water has been steadily leaking undetected while the drywall soaks it all up. Of course there’s always the possibility that your basement wall or floor has a small crack and due to poor drainage on the ground above, water has seeped through the cracks and mold had started to grow under the carpet or behind the walls. As you check each of the areas for mold, it’s important to realize that the mold source may be located in an area that you can’t easily see or get to. Before you start knocking holes in drywall or ripping up the carpet, you’d be better off having an air test performed to determine if mold is indeed present in the air. Something else to remember is that even though the moldy smell may be new to you, that doesn’t mean the mold itself is relatively new. It’s quite possible that the mold has been growing undetected for quite sometime before you noticed the smell. As mold grows, potentially millions of spores are released into the air. These spores can travel through your home and land in places that are naturally conducive for certain areas or items to grow mold. Vases, toilets, wet laundry, sinks and showers for example can start growing surface mold due to the spores in the air landing in and around these moisture heavy items. If you’ve attempted to cleanup the mold in one or more of these areas, and it reappears after a couple of days, that could be a symptom of a much larger mold problem that’s dramatically affecting the air quality in your home. I Have a Mold Problem, Now What? 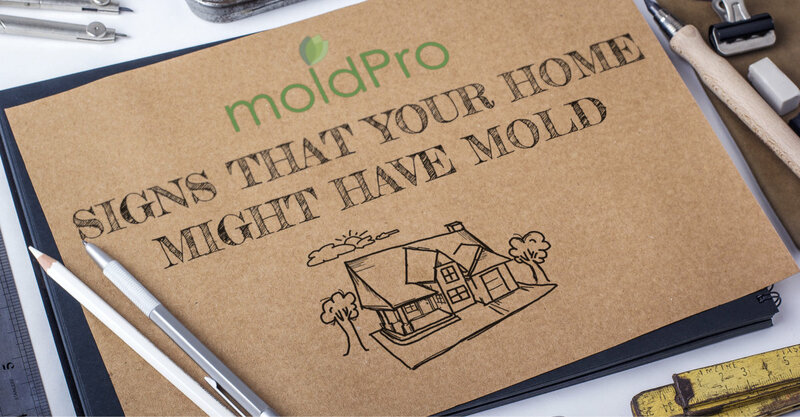 After recognizing the symptoms of mold in your home, the next thing you’d want to do is contact a professional mold remediation company, like MoldPro LLC. The last thing you want to do is underestimate the levels of mold that is present in your home. Only through thorough a professional inspection and comprehensive air testing can you confidently determine the locations and amount of mold present in your home.